The direct production of liquid fuels from carbon dioxide hydrogenation has attracted enormous interest for its significant role in mitigating emissions and reducing dependence on fossil fuels. That is provided that the H2 is from renewable sources, such as photocatalytic or photoelectrochemical splitting of water. In 2017, scientists in China developed a variety of catalysts to covert CO2 to methanol, gasoline hydrocarbons, and even lower olefins with high selectivity and conversion efficiency under relatively mild experimental conditions. Development of these CO2 hydrogenation catalysts makes it possible to reduce CO2 emissions and convert CO2 to value added chemicals, such as fuels and chemical feedstocks in large scale. 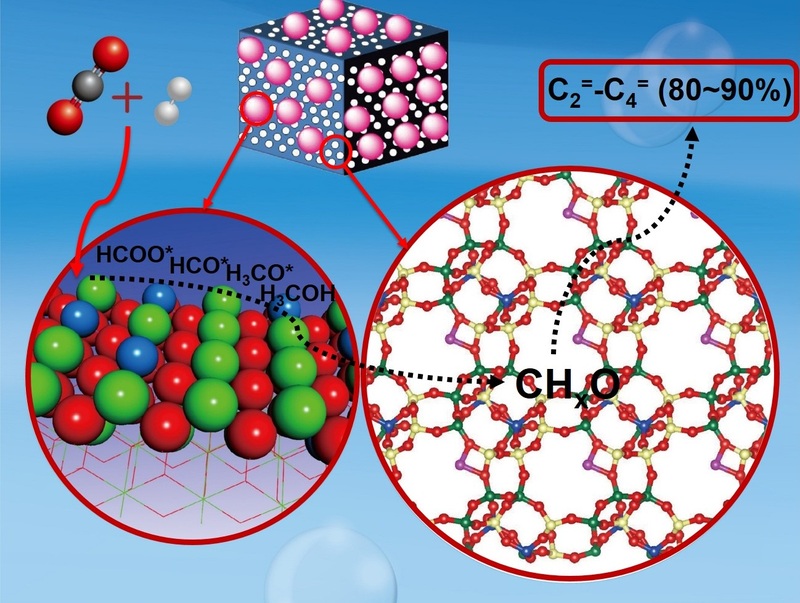 Dalian Institute of Chemical Physics (DICP) has developed a ZnO-ZrO2 solid solution catalyst, which can achieve CO2 to methanol selectivity of 86-91% with conversion efficiency of more than 10% under reaction conditions of 5.0 MPa, 24,000 ml/(g hour), H2/CO2 = 3:1 to 4:1, 320° to 315°C. The catalyst showed high stability for at least 500 hours on stream and resistance to sintering at higher temperatures. The DICP team also achieved selective conversion of CO2 to lower olefins through CO2 hydrogenation over a ZnZrO/SAPO tandem catalyst. The selectivity for lower olefins was as high as 80−90%. Furthermore, this catalyst is stable toward the thermal and sulfur treatments. DICP has also reported a highly efficient, stable and multifunctional Na–Fe3O4/HZSM-5 catalyst. It can directly convert CO2 to gasoline-range (C5–C11) hydrocarbons with selectivity up to 78% of all hydrocarbons, while only 4% methane at a CO2 conversion of 22% and remarkable stability for 1,000 hours on stream. The technologies attracted extensive attention from the industrial sector and now the process is going through a pilot phase to scale up the experimental solutions in China. This breakthrough may rapidly accelerate CO2 utilization in industry, thereby reducing global emissions.